This small breed is a recent development in Japan where its ancestors have been kept as ‘family dogs’ since ancient times. It is thought that the Japanese Spitz originated from the ‘Peat Dog’ that spread from the Swiss Lakes and from Finland about 6000 years ago, before finally reaching Japan and China by 400 A.D. The Japanese Spitz lives from 12 to 14 years of age. As a companion dog the Japanese Spitz should be familiarised with other household pets at an early age and it will then live happily and reliably with them. The Japanese Spitz has a dominant nature and when introduced to a household with other breeds may very quickly become ‘the boss’, even over much larger breeds. Despite its long, pure white coat the Japanese Spitz is a low maintenance breed. Contrary to most people’’s expectations and belief their coat is very easy to look after. Due to its texture, mud and dirt fall off or can be brushed out very easily. While it loves to play in the dirt, this is a fastidious dog that does not like getting dirty and, like a cat, will lick itself clean. Provided they are kept well groomed they should only require a bath at most twice a year. They shed their coat once a year. 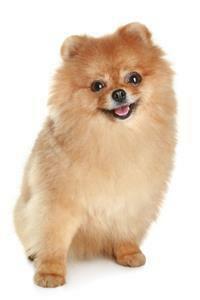 The shedding will usually only last about 10 days and the dead hair is easily combed out. The Japanese Spitz is a family dog seeming to thrive on the different attention and affection from each family member. A young puppy (3 to 12 months) could be a ‘handful’ for children under five years of age without adult supervision. Having said that, they also make an excellent and loving companion for a single person in a flat.